Lightroom has become a very essential part of the workflow process for many photographers, including myself. I cannot imagine managing my photo catalog without Lightroom and I use it every day for my photography needs. In fact, 95-98% of my post-processing work is done in Lightroom and I only occasionally use Photoshop for advanced photo editing / retouching, which not only simplifies my workflow, but also decreases the amount of time I spend on post-processing. Over the past few years of using Lightroom extensively, I have come up with efficient ways to store, organize and access photos on my computer, so I wanted to share a few tips with our readers on how I do it for both personal and professional work. Although there are many ways to organize images, this particular method has been working great for me (and many others that have been reading our site for the past few years). If you are looking for a generic guide on doing this without any third party photo software like Lightroom, then please read my older article on “how to properly organize pictures“. 1) Where do you store your pictures and how? The first question is, where and how do you currently store your pictures? 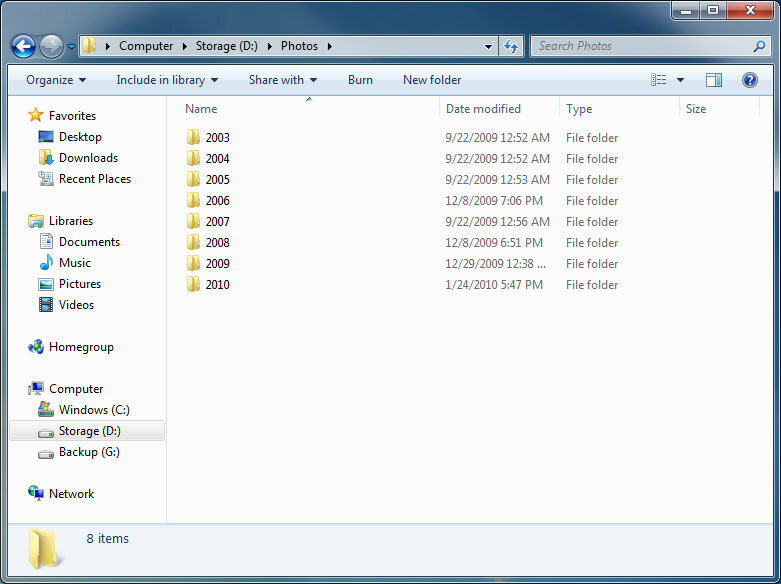 I used to store all of my photographs in various subfolders of my hard drive (commonly in “My Pictures” or “My Documents”), but after I got into photography, I decided that it was best to keep all of my photographs in the root folder of my PC’s hard drive that I use solely for storing photos and small family videos. Hard drives are really cheap nowadays, so creating a properly organized and redundant storage for your photography needs does not have to cost an arm and a leg. For those on a budget, I highly recommend getting a fault-redundant external RAID array (two hard drives that can be configured in RAID 1 / Mirror configuration). If you shoot RAW like me and have a lot of photographs, my favorite solution on the market today is Synology (5 bay) and if you have lots of photographs, I would get the 8 bay version. With larger capacity hard drives, you could get a boatload of storage on even the 5 bay version. These are rock-solid solutions for photographers and they easily outperform the proprietary Drobo system. The nice thing about a storage array unit like this, is that it is configured for speed and redundancy. If a single drive fails, the system continues to run, but prompts you to replace the faulted drive as soon as possible. Once you replace the drive and everything re-syncs, the system goes back to regular operational mode. In the root of my hard drive, I have one folder called “Photos”, where I store all of my pictures. Inside “Photos”, I create one folder per year. Then inside each year, I store photographs by events. For example, a family trip to Denver Zoo in 2007 is stored in “Photos\2007\Denver Zoo”. If you shoot professionally, you might want to have two separate folders under “Photos” – one for your personal pictures and one for your professional work. In that case, simply add another level of folders underneath “Photos” and your structure would look like “Photos\Personal\2014\My Event” or “Photos\Professional\2014\My Event”. Go ahead and create the first top level folder “Photos” and if you want to separate your personal and professional work, also create the two folders underneath. Do NOT create any more folders underneath and do NOT move or add any photos yet. Once you define and create your initial structure, it is now time to create a Lightroom catalog. Start off with a new Lightroom catalog by going to File -> New Catalog. For performance reasons, I prefer to store my catalog along with image previews on a fast SSD drive, while storing the pictures on a fast external storage array, but you might want to keep it all in the same drive for simplicity purposes. If you have under 10,000 pictures, you can store them all in a single catalog without much impact on Lightroom performance. If you have over 10,000 pictures, then I recommend creating one Lightroom catalog per year. Just create one folder in the root folder called “Lightroom” and store all of your catalogs there. There are two settings that I changed here. I modified the “Default Catalog” option, where I set it to “Prompt me when starting Lightroom” – this basically makes Lightroom prompt which catalog I want to load when I start up Lightroom, which is convenient if you use multiple catalogs. If you only have a single catalog, there is no need to change the default setting. The second option is “Show import dialog when a memory card is detected”, which simply tells Lightroom to automatically fire up the import screen when you insert your memory card. I also leave “Stack With Original” checked, so that an image that is edited externally stays attached to the original RAW file. 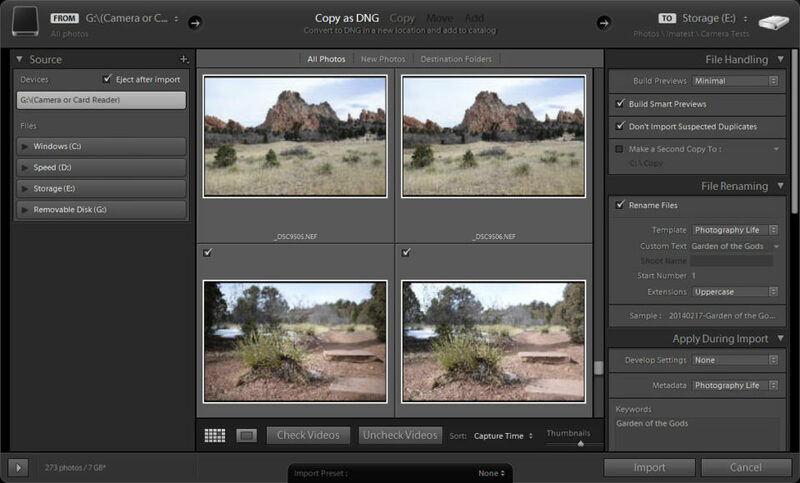 Pay attention to the “Import DNG Creation” settings on this page. I set “File Extension” to “DNG”, “Compatibility” to the latest Camera Raw version available, “JPEG Preview” to “Medium Size” and left “Embed Original Raw File” unchecked. The important settings here are “JPEG Preview” and “Embed Original Raw File” that control the total size of your DNG files (read more about the DNG format here). By default, every RAW image contains a full-size JPEG image (see RAW vs JPEG) inside that is stored as a “Preview” (the “Preview” image is what you see on the back of your camera when you take a picture). By setting the “JPEG Preview” option to “Medium Size”, you are telling Lightroom to generate a smaller version of a preview inside DNG files, which will save you up to 15-20% of space per file (depending on the size of the RAW file). While you might think that it is not such a big deal, it does a make a huge difference when you have tens of thousands of pictures. The only penalty is the fact that the image opens slightly slower when you try to open a full version of it in Lightroom later, simply because it has to generate a full size version from the RAW image. If the speed is important, you could always generate full size previews in Lightroom later. The checkbox “Embed Original Raw File” is something I would recommend to leave unchecked, because if you check it, your DNG files will actually be much larger than the original RAW file (DNG + RAW will be combined in a single file). I leave the last “Interface” tab at its default settings. 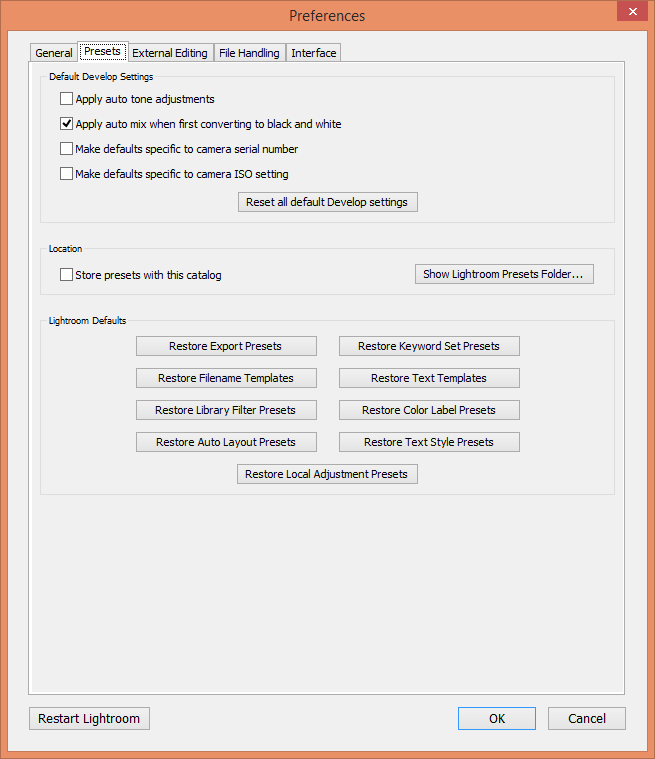 The next thing we need to modify, is your Lightroom Catalog Settings. You will have to do this once for each of the catalogs that you create. 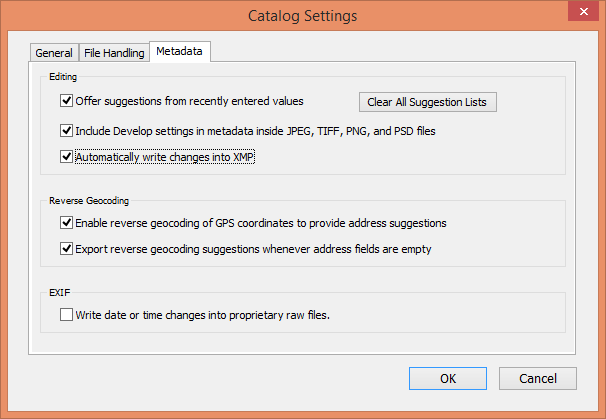 Go to Edit -> Catalog Settings to bring up the “Catalog Settings” window. I usually leave everything to default values in “General” and “File Handling” tabs. However, if you want Lightroom to render bigger previews to match your monitor resolution, pick a different value under “Standard Preview Size”. Note that the larger the preview size, the more space Lightroom’s cache will take on your hard drive. The first two options “Offer suggestions from recently entered values” and “Include Develop settings in metadata inside JPEG, TIFF, and PSD files” are checked by default and I do not touch them. The last option “Automatically write changes into XMP” is unchecked by default. This is the one I usually recommend to turn on, because it makes Lightroom write your changes right into the DNG files (or XMP sidecar files that go with your RAW files) as you work on them. Why is it important? Because if your Lightroom catalog was to fail and you lost all of your catalog data, the image file would still keep all changes that you’ve made in Lightroom! It is also very useful if you happen to open that same file in Photoshop or other Adobe applications, because all changes will be immediately visible as you work on the file. And if you were to lose your Lightroom catalog completely, you could just import all the images from your hard drive and all changes would migrate through (except for the history). The penalty of keeping this option checked is slower performance, since every change is immediately written to the DNG / Sidecar file. If performance becomes a problem, you can turn off this setting and occasionally force Lightroom to save changes to files by selecting all files (CTRL+A in the root folder) and saving changes (CTRL+S). The entire import screen is organized very similarly as Lightroom itself, the left side being the location where you will be grabbing the files from, while the right side serves as the destination side, along with import settings. The middle section shows all images to be imported. The “From” section has been designed in such a way that Lightroom is able to differentiate between permanent storage and your device or card reader. The nice thing is, the import screen is dynamic, meaning whatever changes happen in the system, the screen gets updated in real time. 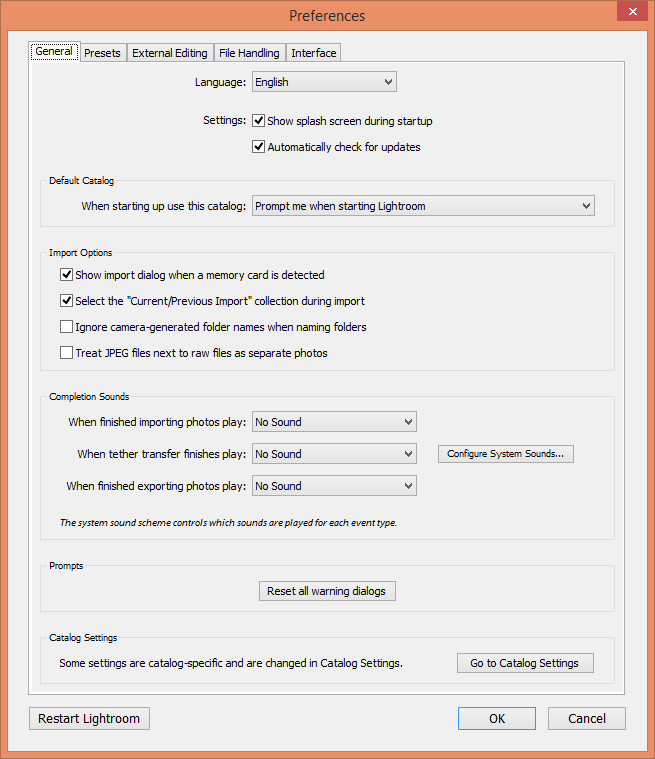 For example, if you open the import screen and then disconnect your camera from the PC, the device will simply disappear from the screen. Reconnecting the camera will add the device back into the screen. 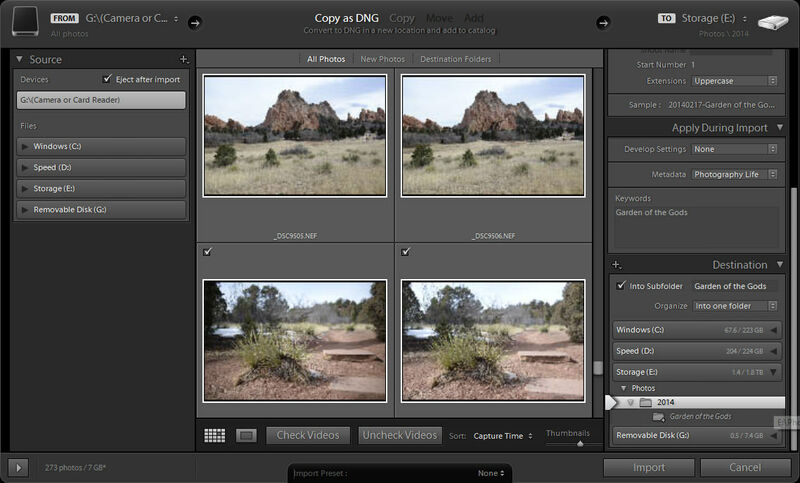 Since I standardize on the DNG format, I typically leave “Copy as DNG” selected in the top middle section. 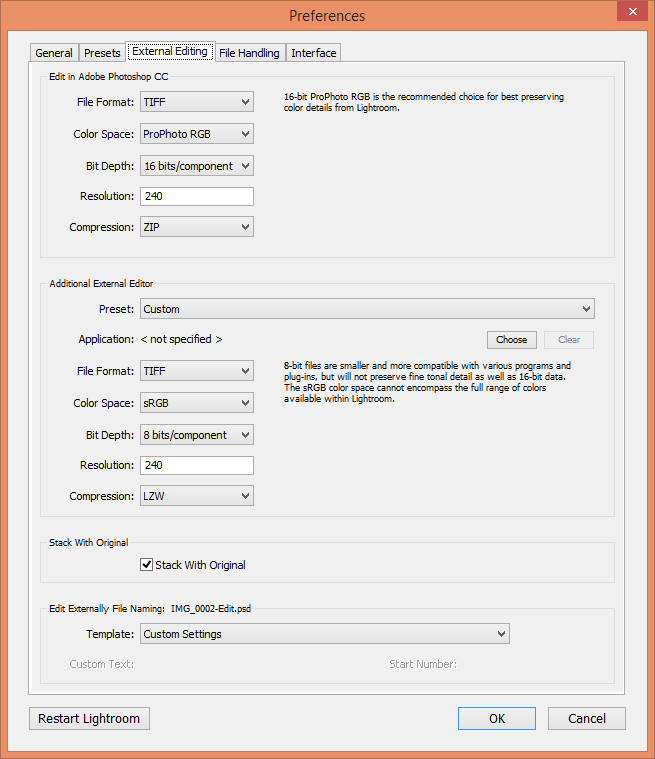 If you choose to keep the original RAW files, then pick “Copy” instead. The File Handling section consists of four choices – “Build Previews”, “Build Smart Previews”, “Don’t Import Suspected Duplicates” and “Make a Second Copy To”. I leave the Build Previews option on “Minimal” to save time during file import. However, if you have plenty of storage and you want to speed up the time it takes for your files to render when you zoom into them, you can set this option to “1:1”, which will generate full previews. 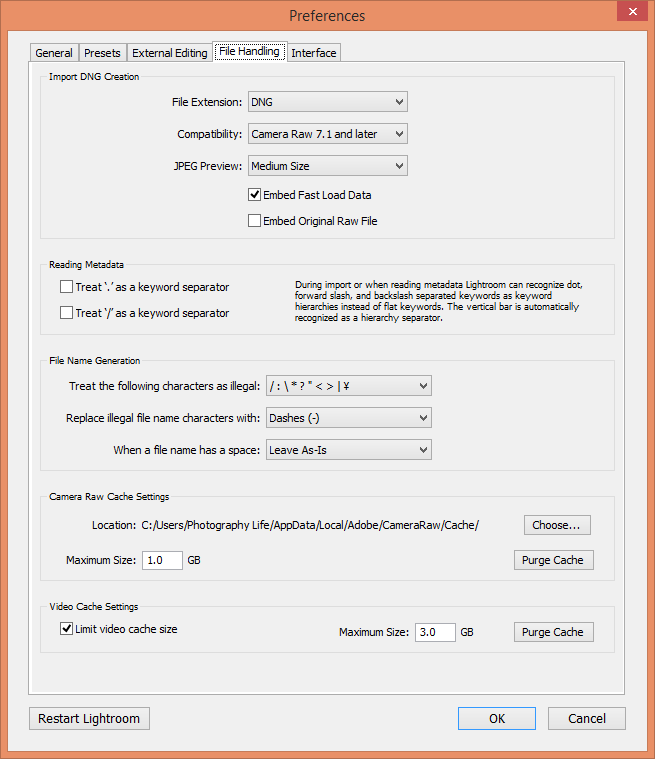 Normally, I don’t recommend this, unless you want to speed up the process of editing high resolution files (see my article on efficient Lightroom workflow for high resolution images). The “Build Smart Previews” option can be very useful for situations where you have a laptop that stores just the catalog and your actual images are stored on external storage. If you happen to travel and need to disconnect from your storage, keeping this option turned on will create image previews that you will be able to work on, as if you were still connected to your storage. Once you come back and reconnect to your external storage, all the changes will be retained. If you are using a desktop PC and the storage is attached permanently, I would turn this option off. I always keep “Don’t Import Suspected Duplicates” turned on and I do not use Lightroom’s way to back up imported images, so I keep the last option “Make a Second Copy To” turned off. The File Renaming section consists of variables that are used for renaming your files. I always rename my files to the following format: “YYYYMMDD-Custom Text-Sequence Number.DNG”. The first part is the file date, for example “20140217”, which stands for February 17, 2014. Then a dash is followed with a custom text that I type during each import, which is then followed by an incremented sequence number. I like renaming my photos, because I do not like to keep photo names like “DSC_1000.DNG” that mean nothing and get duplicated over time. By renaming the photos, I know that I could simply take all images from all folders and put them all into a single folder without running into duplicate file names. I highly recommend taking the same or a similar approach and uniquely identify every image you import. Create a similar template, then save it as a Preset and click “Done”. Then simply select your preset under the “Template” drop-down. The next field under “File Renaming” is Custom Text – the text you can type to identify images. For this example, I used “Garden of the Gods” as custom text, which means that my first file will be named like “20140217-Garden of the Gods-001.DNG”. The “Start Number” field lets you type the first number that the system will use, so if you type “500”, your first file name will have a sequence number of 500 and all consecutive numbers will be incremented by one. This is very useful during multiple imports into the same folder structure – I simply look at the total number of photographs in my memory card and put the number in that field. I always leave the extension in uppercase for consistency. The last field is “Keywords” and that’s where I type keywords related to what I am importing. Keywords can be great to be able to locate photos by event, location, theme, etc. 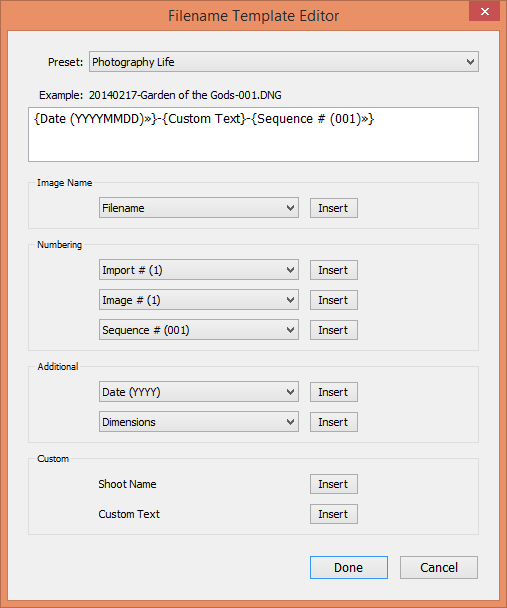 For the above example, I used “Garden of the Gods” keyword, which saves this keyword to each file and the Lightroom database. If I go back to the Garden of the Gods again later this year, I would use the same Keyword to group the two events together. That way, even if I end up putting photos into different folders, I will still be able to locate them by this keyword. Since I store all of my images in a master folder called “Photos” and then subfolders by year, I simply select the year under “Photos”, as shown above. As you can see, the system is set to create a folder under “E:\Photos\2010” called “Gardens of the Gods”, where all the photos will be imported. 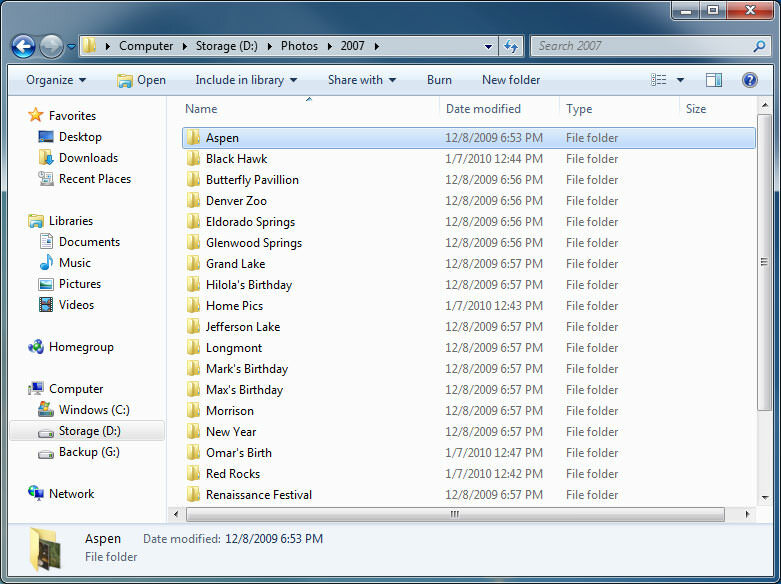 If I pay another visit to the Garden of the Gods, I will choose the same folder and the system will create files with a different date, so I won’t ever run into any problems with duplicate file names. I always sort my import images by “Capture Time” under “Sort” drop-down. Once you choose the destination folder, simply click the “Import” button to start importing your images. The import window will go away and you will start seeing the images popping up in your Lightroom catalog. Now that you know how to import your images with custom templates, go ahead and import all of your pictures into Lightroom and make sure that everything gets transitioned correctly. Do not forget to change the folder names along with “Custom Text” and “Keywords” fields upon each new import in the “Import Photos” screen going forward. Otherwise, you will end up with a bunch of unwanted folders and incorrect file names and keywords. If you accidentally imported your pictures with wrong settings, it is not a problem. 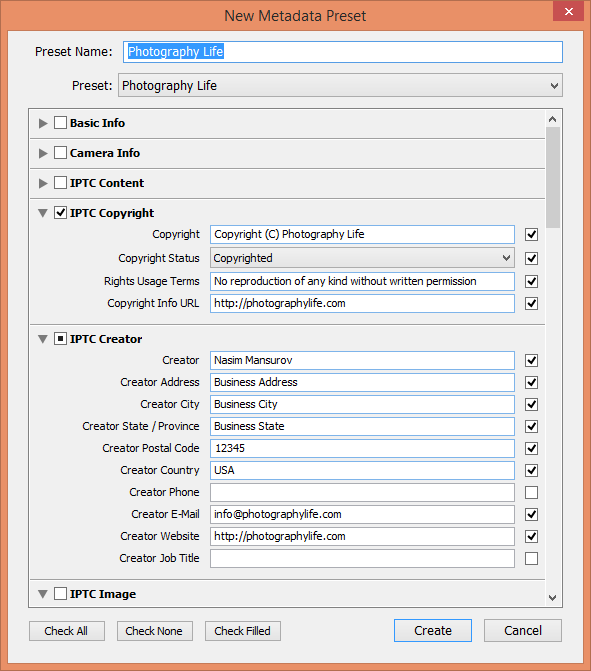 Just select the imported pictures, then change the keywords under “Keywording” section in the “Library” module, then rename the folder to the correct event name and press “F2” or go to Library -> Rename Photos to mass rename your pictures. If your pictures go out of sequence for whatever reason (for example your sequence numbers are repeated, but with a different name), then simply select all pictures and batch-rename them all by pressing “F2” on your keyboard. Give it a new sequence number and it will start renaming them based on the age of the image or your selection criteria. By now, you have done a lot of work to re-organize your photographs and you have completed importing all of your pictures into Lightroom. It is definitely a good time to perform a full backup of both your Lightroom catalog and your pictures. Many people assume that the backup functionality in Lightroom backs up their photographs too. That’s a very wrong assumption! Lightroom does NOT backup your photos – it only backs up your Lightroom catalog, which is useless without your images. You can afford losing a Lightroom database, but you cannot afford losing your pictures. Therefore, you should always backup your photographs first, then worry about Lightroom. Get your external backup drive ready, plug it into your computer and turn it on. Go to the root folder where you are keeping your photos. In my computer it is “E:\Photos”. Select this folder and drag and drop it into the backup drive’s “Photos Backup” folder or something similar, which should start the copy process. Wait until all pictures are copied / backed up. Make sure that you do not have any errors and the copy process is completed 100% successfully. Now backup your Lightroom catalog. Locate the Lightroom catalog file in your hard drive (which should have an extension “lrcat”) and also copy it to the external drive. I usually store my Lightroom catalogs in a folder called “Lightroom Catalog Backup” on my backup media. The above process could be easily automated by third party backup programs or with some built-in backup tools within your operating system. I highly recommend to set up an automated job that backs up your computer as often as possible. I also recommend backing up your data to at least two different locations every time. I hope this guide will help you to keep your pictures organized in Lightroom. Please let us know if you have any questions in the comments section below! That was an interesting read. I have been using LR for a couple of years so it was good to read your suggested settings and compare against my own. Thanks, Tony. A great post, but a question please. Until now I keep all my images in folders as you describe, however I do not keep the LR catalogs in assigned folders. For each Image folder I have, e.g. Norway2013 I keep my Lightroom catalog in that folder. In other words every image folder I have contains its IRCAT file. I now want to move to your regime of a folder per year referencing images elsewhere. I know that this would take some work, but can you please advise me of how difficult this would be. Do I just have to copy the lrcat’s to another folder, then point it towards the relevant images, or is it more difficult than that please? The good news is, you can easily migrate all catalogs together into one master catalog. Simply create a new catalog, then go to File -> Import from Another Catalog… then go through each catalog and import everything in to the main one. Once you are done, make sure that you move all the Photos in the same general structure as I recommended, so that everything stays neatly organized. You won’t regret this, as it will save you a lot of time and frustration in the future! Thanks Nasim. I shall spend a few hours doing that now. Thanks for the detailed post. Just needed some inputs for how to add already existing folders on your HDD imported earlier using View NX. Can we add them to the same catalogue or create a separate one for them ? Mahesh, it is really easy – just Go to File -> Import Photos and Video… then select the folder where you previously imported using View NX. Once you define the destination, either pick “Copy” or “Move” from the top import window (whichever makes you feel safer), then your files will be imported into the catalog. Check out the video above – there is a good example on how to do this! Loved the video at the end. I find it a lot easier to follow on video. It stops me from having to go back and forth to Lightroom at each step to try it as Im reading it. You obviously use a desktop with an external HD to store you photos? The reason why I ask is that I use a macbook and one of the many things that interested me in upgrading from LR4 (and completely dumping Aperture) is the ability to build smart previews. Down the track Im thinking it will be smarter and safer to store all my originals on an external drive, but I have 2 questions. Firstly, how do you build smart previews of files already in your library? And second, when I import photos to the external HD through LR5, I tick the create smart previews box. But if I’m on “the Road” without my external HD, how do import photos into LR? Do I have to import, including the creation of smart previews, to my C drive and the move them to the external drive when possible? On another note, I know you busy but perhaps someone could run a Q&A post for say 30 days. I know Ive got a couple of questions on camera settings with a speedlight. Often people may have a question on a topic you haven’t covered or something written a while ago and the infomation could be updated. Did I mention I love the video Tutorials. David, we will definitely work more on creating videos for our readers, thank you for your feedback! Yes, my primary station is a high-end PC that I built myself for editing. My current year photos are typically stored on my local hard drive (a RAID 1 mirror), but my older images and backups are stored on the external volume. At the end of each year, I retire the previous year catalog to the external storage and make all backups, then create a new catalog for the current year and store it in my computer (along with photos). Lightroom catalog is always on a fast SSD drive, while the RAW files are sitting in the above-mentioned 2 TB RAID 1 volume. As for the Q&A post, that’s an interesting request! Will talk to Romanas about how we could make it work, thank you for your suggestion! Nasim, I discovered and have learnt a lot from this site last six/eight months. I am also supporting the site by small money every month. I am currently using a laptop and Nikon ViewNX2 to editing the photos. I have already purchased LR5 but do not use it because I am afraid the file orgnize issues. This article tells something exac what I need to know. Thanks a lot. But I remaind a question. Just I said above, I am using a laptop now. I am considering to get a desktop for editing that shall be much effective than using a laptop. If I start to use Lr in the laptop then desktop sometime later, how easy/or difficulty to move Catalog to desktop, once I have it? That is the issue prevent me to use Lr now. thanks and expect to get answer. Thanks for the read – very interesting. I use Aperture and store all important ‘keeps’ for clients within Aperture on my Macbook. The originals of the also-rans are stored as Referenced files on external HDs. This enables me with one click to back up the whole of Aperture (inc. the important originals) to an external RAID array. I like a simple life and it works for me! John, thank you for sharing! I agree, making things organized makes your life much easier, especially when it comes to backups. Thank you for this article, very informative, you have suggested a somewhat similar system to the one I use except I want all my images stored in the chronological order in which they were taken. As you did at one time, I store all my current photos in My Pictures and after post-processing put them in various subfolders in 2 hard drives. I tried Lightroom a few years ago, liked it, but gave up on it only because of its catalog/file system. I would try Lightroom again but only under 1 condition: I want to keep my current filing/storage methodology without having to go anywhere near Lightroom’s catalog, etc. i.e., take my photos from my disc, load them into a folder in My Pictures, import them into Lightroom and afterwards save them back into My Pictures or another drive. Can this be done? Peter, of course it can be done. Lightroom is very flexible and it allows for all kinds of things. If you are worried, you could continue storing your photos in their old location and simply use Lightroom to edit them. When you import images, just make sure that you choose “Add” on the top part of the Import window. When you do this, none of your files will be moved and Lightroom will simply add information into the database about where the files are stored. If you decide to delete files or move them around, you could use Lightroom to re-locate them, or you can synchronize folders and find missing/moved files and get rid of them. One thing I’ve learned the hard way is that once a catalog is in Lightroom, any changes at all, including deleting pictures from a hard drive, has to be done through Lightroom, or it reminds you that it can’t find pictures. Paul, Lightroom can be tweaked to work much faster. Once you import the photos, the system generates previews and those are stored in your computer. Next time when you want to review images quickly, the process should be fairly fast and straightforward. While accessing images quickly via the operating system might be more efficient, I find Lightroom’s search and filtering capabilities to be very powerful. Sometimes I want to find a photo from a specific day, or a specific camera or lens – I cannot do that via the operating system, but it is a real breeze in Lightroom. As for making changes to images on the operating system, while I do generally recommend to do all that within Lightroom, there are ways to get the information resynchronized. If you move photos, you can point Lightroom to the new location and it will automatically resync. If you delete photos, you could periodically click on the folder and click “Resynchronize”, which will find all the new photos and show you the missing ones that you can then delete. Lastly, yes, changing file names in Lightroom is super simple – and I explained the process in the above article. Select all files you want to change, then hit F2 and change the name to whatever you want! Give Lightroom another try – it is a very powerful tool! pallet on the right side panel area and Under filename drag the name and extension and type a new name and extension followed by ”CR”, and its done. To see the change in explorer place your cursor on the the image in the Library and hit the right mouse button and choose “show in explorer”. To return to LR just close the explorer page. Could you please comment on the performance of LR5 vs. LR4? I observed a discernible difference in the time to complete tasks with LR4 compared to LR3. I have heard that LR5 is even slower. I have a computer that’s only a year old, so it’s not a matter of trying to run on obsolete hardware. But I’m not willing to upgrade my PC every 2 or 3 years just to run Lightroom. So I have not gone to LR5 yet, waiting for the verdict on performance. Mark, for some things LR5 is much faster than LR4, while in other areas it feels slower. For example, synchronizing changes, changing file names, moving files around, exporting and performing other OS intensive tasks is much faster in LR5 than LR4. If your catalog is big, LR5 seems to struggle more than LR4, most likely due to more data storage requirements. Overall, I find LR5 to be better than LR4 for my needs, so it was worth the upgrade. If your machine is only a year old, it will easily run LR5! I have a 3 years old computer with over 1.4 terabytes containing hundreds of programs and gigs of data installed. For years I buy to do my computer maintenance a program named “Advanced system optimizer “. It is cheap and everytime I have a slow computer ASO fixit it. The slow computer problems are mostly caused by bad registries or a hard drive needing cleaning and defragmentation. I have never reformatted my drive, but I had severe virus infections two times so I decided to recover my drive from a a partition backup created with “Acronis true home image”. A very good tool that you can get free is CCleaner from Piriform to clean your web browser and control your startup programs. They can also severely slow down your computer leaving few resources for LR. My computer is a desktop with an Asus P7P55D-E premium motherboard 8 gigs ram intel i7-860 ghz processor with win 7 64 bits pro, so as you can see its quite old technology, 2 terabytes WD black hard drive. I have over 15k pics on my drive and they were all imported in LR, and I don’t see any speed problems with any versions of LR from v2-5 included. to conclude If there is one program a photograph needs to learn, its this one. Luc, I agree, thanks for your response and feedback! This is really helpful. Thanks so much. I just watched your lightroom management video. I have my lightroom set up by folders, but it is under the harddrive. How can I make the top folder a folder called Photos from the set up I have. I import raw files into Lightroom. I then carry all post processing from there. When you install the current version of Photomatix Pro you are given the opportunity to install the Lightroom plugin. Thereafter you will be able to select your images and directly export them for processing in Photomatix. And then when you save the processed image it will appear back in Lightroom. Remember to choose the 32 bit option in Photomatix. Using this method you are not working with degraded images like JPEGs. For a long time before lightroom my file structure was one folder per year with one sub folder per month. Works fairly well and I still import in this manner. However, I wondered, if you keyword properly (which I have yet to do) is it better to store all images in one single folder as this allows you to stack and so forth in LR or do the cons outweigh the pros? This is a BRILLIANT video! I have 7 catalogues and I want to reorganize the way you did. My photos are not all in one folder though. 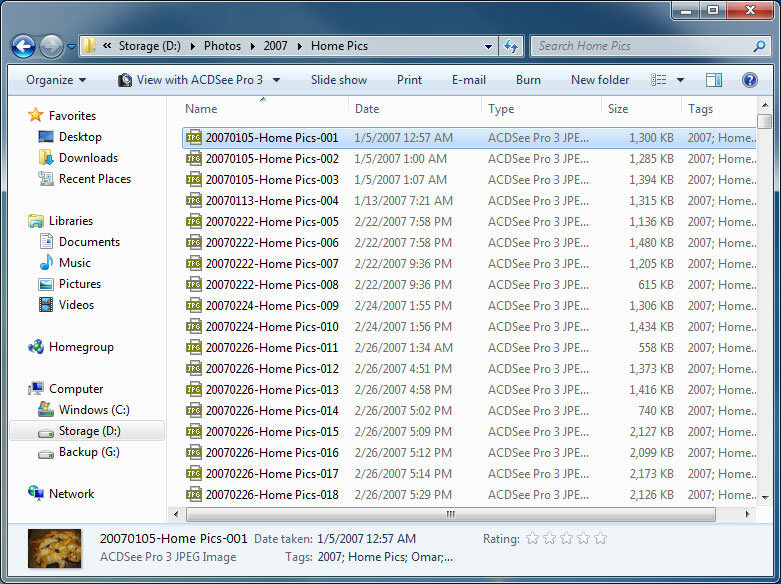 If I move photos in the operating system, it will make my catalogues more messy because it will send me missing photos. What would you suggest? 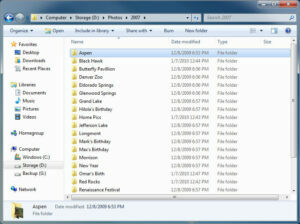 1. organize the photos first in the operating system and put all in one folder? 2. start a new catalogue and start fresh? 3. start a new catalogue and import all the catalogues? Since now i have a lot of photos in LR (RAW+JPEG), I’m interested is there any way to delete RAW files from disk I don’t need and just keep JPEG for some photos? Is it possible to do that in LR, because when I press “delete” and then I have options “delete form disk” or “remove” and non of that will remove only my RAW files? Do I need to delete it manually? I am a new LR user and need a little help getting started. I just finished putting all of my photos together on an external drive (they are backed up on a second external drive). They are in one master folder (with sub-folders). I would like to make a new LR catalog on my desktop (and keep the backup of the catalog elsewhere), but am unsure of the best way to do this. I read your articles (and other articles), but no one seems to address this seemingly simple task. Would it be too much trouble for you to provide a list of steps that I need to take? I suggest you to organise album folders first. I use “Beautiful Backup” app for this job. Cleans duplicates, extract photos and videos from all folders and create one chronological folder structure. I use Lightroom on my macbook to edit a catalog on the external drive where my photos are stored. If I generate smart previews for these photos as you describe above, are the smart previews by default stored on my macbook, or with the catalog on the external drive? I know I want the smart previews on my laptop, but I have had no luck determining how to explicitly indicate where I want them saved (e.g. via preferences). Do I need to use ‘Make a second copy’ to force a local copy? I am about to do this on my own hard drive but I have a question. See I also shoot in RAW and it sure is a big chunk of file but when we share photos to our friends and family, we don’t share raw, we share the jpeg or the save for web files. How do you share this photos to them. Do you have another folder for this JPEG files? is it also inside your Pictures folder? The reason I have photos every where on my computer is because of this JPEG files. Right now I have a folder named RAW and a folder named JPEG. But the folder JPEG is just as clattered as you might expect. So how do you handle this? I am just beginning to use Lr and have one problem with the file structure. I am used to using a Windows file structure in which nested folders are independent of the mother folder – the mother folder with 2 sub-folders (10 files in each) shows 0 files. 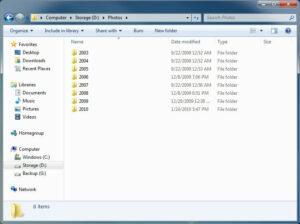 In Lr is see 20 files in the mother folder. I guess I can adapt to this, but it is confusing to me. By default LR grid view shows you the contents of the folder you select *and* all of its subfolders. Depending on how you organize your photos and your workflow, this can be *tremendously* useful much of the time, but it can be sometimes confusing if you’re not familiar with how best to take advantage of it (and when your life will be easier if you turn it off!). Click Library -> Show Photos in Subfolders to toggle this setting on and off. This change will not only be reflected in the grid of photos you see when you click on a folder in the tree, but will also be reflected in the photo counts for each folder along the right edge of the tree. Regarding the technique of a separate catalog by year for large image libraries, what happens with tags and albums(collections) spanning years. Have individuals tagged in all years and event images in albums(collections) also spanning all years. If I open a catalog for 2014 and then select a tag for an individual in 2012-14 or an album with images from 2012-14, will I get all images or just those for 2014? Hi. Thanks for the writeup. Where do you export your jpg after processing? in the same folder, or subfolder as the original? or under a complete seperate root folder? I keep an output or render folder where I render everything to unless its a specific collection or specific job, in which case i render to a folder for that one job labeled for that one job within my renders folder. So in renders folder there is folders for many dif gigs and jobs or the general renders I often make not always for a specific task, just good photos i took. I am new to LR and am using LR5 as a first year Graphic Design student. I’m studying online, which I find extremely difficult so will be changing to f2f next year. Without human interaction it’s virtually impossible for me to grasp many practical concepts, especially with my photography subject. Which brings me to this site and therefore this comment :) I have found the context of my school curriculum/material really lacking as the language they use speaks only to people with existing knowledge of this subject (despite there being no prerequisites) and I have none so I spend most of my time searching for other resources online. This article has been really helpful, yet there is one thing I’m still particularly confused about re image storage. I apologise in advance for my confusion, too. Is this the process I should be following? I think what is confusing me the most is the difference between the catalogs that are created versus the original files. Obviously the aim is to have original files (that remain as negatives/untouched raw files so to speak) AND working files (that are simply your LR files???). Is that correct??? In the past I have confused myself further by having duplicates all over the place. As I’m new to LR I would like to start off doing it correctly. Already I have about 1000 images that I have been playing around with since installing LR a few days ago (which we are meant to be cataloging, but none of this file management is covered in our course, nor are the actual properties of a Lightroom ‘catalog’ – something I only understand since reading this article). Currently I have one copy of my images on an external hard drive (my back up), plus another copy in subfolders within my school folder on my local hard drive. Since using LR these last few days I have majorly confused myself with how I should be cataloging the images within these subfolders…. My goodness, what a mouthful. Thank you so much in advance to anyone who can assist me. its three in the morning so quite late. I will just make it short. Your steps 1 to 3 are valid as well as importing your files directly from the sd card of your camera. When you import files in the open catalog by using the “ADD” option (defaults) no files are moved from where they are located on your hard drive. It is just make LR place a pointer on each of your files so it knows where each one is located on your drive and their individual names, and add the folder in your folder list located on the left panel. If you use the “Copy” option you will copy all the imported files in a specified directory on one of your drives choosen by you everytime you do an import, LR will also add that folder in your folder list. In both cases you should not “delete” or “Move” your imported pics using the “delete” command of your O/S (mac, Windows), you should do theses things in LR only, otherwise LR will loose the link to the moved or deleted files shown by “?” in your folder list. If you click on any folder (directory) from that folder list, you will see in the “Library” module a preview of all the pics located in that folder. You can choose one or many using the “CTRL” or “SHIFT” key and drag them to one of your collections that you have created previously. Clicking on that collection will show you the preview of all the files you have added to it, reminding you that not a single files has moved from their original place on your hard drive. That’s the reason you can add the same pic in many different collections. Before going to bed I want you to understand that if you want to add a folder to the folder list “+” you will have to choose a folder containing pics on your hard drive, and that you will be adding (importing) all the pics preselected by default, or you can deselect them and select only the ones you want to import. Thank you so much for your response. It was greatly insightful. I have since discovered the practical differences between how you load images into LR (i.e. move, copy or ADD) and therefore have a greater understanding on how to manage my files to avoid creating 50 copies of everything. 1- When choosing one or many pics in a “collection” and hitting the “Delete” key, no files are destroyed they are only erased from that collection. To get them back you have to click the folder in your folder list where they are to display them in the Library module again , and drag them back in any collections. 2- When you are in a folder list your Library module display all of the pics of the choosen folder. 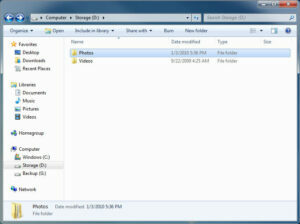 If you use the “Delete” key on one or many pics, you will have to choose “delete from disk” (erasing the files in explorer) meaning the files are lost forever unless you get them back in Windows garbage bin, while the option “Remove” (does not delete the file in explorer) just remove the file as imported, so you can import them again with the “Import” option. If you choose theses options your pics are eliminated from all the collections where they were part of. Hello. Thank you so much for the informational video! My LR is a mess and I am trying to get it cleaned up. I went through your entire video, step by step, but there still seems to be a problem. When choosing pics for a certain file, say, “2013” and including the subfolders for said event, it is putting the images into the file, but not removing them from the original source. Does that make sense? When you moved your pics from your “mess” folder, eventually it was a 0, and mine is not. Rachel, that means you are not moving photos and copying them. Make sure to move images when dragging and dropping to different folders. I’m not sure what is happening then, as even when I manually drag them it tells me the photo is already in the folder, just not disappeared from the original folder. I appreciate your help. Nasim – great article and thank you for sharing your knowledge. My only caveat is on RAID arrays, of which I originally began with the same approach. I discovered earlier that they are not for backup but for immediate access and convenience. I was better served by having my data copied to another source with parity checking to ensure the data integrity of the files. This is because, in theory, corruption on either RAID drive would be copied to the other, thus having two working drives with corrupted files. Only more expensive systems and software can keep a history of file integrity and determine whether changes to a file are as a result of corruption, preventing a corrupted file from being written over a legitimate file on another drive. I’ve yet to be satisfied with a real solution but realize that I probably would have been better served by looking for these solutions for long term storage and RAID arrays for immediate access for editing. Just a thought on these systems and I’m guessing that you already have some insight into this issue. I have thousands of images from work as well holidays and have been searching best method to organize them until I found your video about image management in Lightroom. It really convinced me that I should start learning Lightroom. So, I am a brand new user and just started with Lightroom 5. I followed step-by-step and arranged my folders and files as you described in your video. Everything looks fine in Lightroom, 5 until I finally checked in explorer. Some new folders that I created in lightroom are there but some folders that have been deleted (in lightroom) still exist. There are also other folders (and files) that are not visible in Lightroom but exist in explorer. I learned to understand that lightroom works in catalog. In this case, how can we make our folders and files structure in HD similar as in Lightroom? Did I missed any steps during export? Thanks Nasim, for your passion to share knowledge with others. Confused, but not by your article … more due to that I first did what Adobe Lightroom said to do, and then I found you. Here’s my issue: I have over 100,000 images in one catalog that I imported from a massive iPhoto library. Lightroom states to create a new catalog per year, which I did with my first catalog called “Catalog 2013” using instructions here => helpx.adobe.com/light…urces.html … however, I am not sure if my massive iPhoto library now called “Mess Catalog” is keeping copies of the 28,147 photos that I added to my new “Catalog 2013” so I stopped creating other annual catalogs since I don’t want to store one massive catalog and then duplicate each by year in new annual catalogs … the current “Mess Catalog” still has one folder followed by subfolders based on the day/month/year of each set of photos, including 2013. I am scared to delete those 2013 subfolders from the “Mess Catalog” as I am not sure they are linked to each other and may be deleted from both catalogs. Help! Thanks for the clear and informative article. I found it very helpful! I just want to add my 2 cents worth. If the photos are not in some sort of decent order on your hard drive with a simple naming strategy, then huge problems will come when trying to sort them in a 3rd party software such as Light Room or any other. Its vital to tidy them first, then backup…and only then start to include them into another cataloging system. Beware losing precious photos is painful. Hi, I just want to say: AMAZING! article on how to organize, I have finally found a solution thanks to you. I been organizing my photos by YY-MM-DD and not able to rename the files, after that I use picasa which is a PAIN to try and find a specific picture, but thanks to you, I guess my pain is going to go away. BUT, I just have one question and need your help. In the part where you rename all the files in a custom way. What happens when let’s say a month later you added new pictures to that folder, would those new pictures be rename as the other ones and continue the number sequence automatically or you have to run the renaming tool again and pick a continuing number sequence? Thank you in advance. I create subfolders in the main one for a photoshoot. Oen called capture where all the original raw files go. Then master where photoshop adjusted ones go then select where the best stuff goes. Plus I output to a different folder for jpgs. I took this from a Plearn lesson. I am moving from Aperture to LR6. I have a Nikon D800 and have thousands of pics in Aperture mainly RAW and have successfully transferred to LR6. I was hoping the names on the Aperture folders will get transferred but everything in LR is arranged by dates with folders names as May 2015 etc. Also after importing from a CF Card, the names of new folders are also date based. Plus despite the previews looking normal, the pics themselves are all very pixellated. Can you please help? when you transfer them to LR using the command without moving them physically choose the option at the top of the screen instead of or where in both cases you have to specify in the right column the new location where you want your files to be located. The option just create a set of pointers where every files are located without moving or changing their names, but you can choose the option to place them in an existing collection or create on on the fly using the option. Thanks so much for the comprehensive article. I work off of two computers — an iMac and a Macbook Pro, and currently store both my catalog and my photos (RAW, XMP, PSD, etc) on an external hard drive so I can move back and forth between them (I back up to another external hard drive). You mentioned it’s best to save your catalog to a fast SSD drive and photos elsewhere. Is there a way for me to do this and still be able to access the catalog on both computers? Also, I round trip my more advanced editing from LR to PS and back, and it currently saves a PSD alongside the RAW file. I have not separated these out into separate folders. Do you think it would be useful to do so? The main disadvantage of LR is the fact that catalogs cannot be stored on a netwerk share (a NAS for example) or a removable harddrive. If this was possible you could easily access your catalogs on any of your devices (iMac and MacBook). The only solution that worked for me (I’m in the same boat with an iMac and a MacBook and all my photos stored on a NAS) was syncing the LR Catalog(s) between the iMac and the MBP. I do this with the build-in sync software of my Synology NAS (CloudStation), but another solution could be using Hazel. That nifty piece of software lets you do a lot of synchronising tasks (among other useful things) and I think it can also sync a LR catalog. Another way is to manually copy the LR catalog form the iMac to the MacBook and vice versa. But belief me, that is not a very solid solution, and things can get messed up very easily if you ‘forget’ to copy the catalog from one device to another. Try getting your catalog(s) automatically synced between your devices and you’re ready to go. I’ve got a lot of photos neatly organised by year and month (e.g. directory/years/2012/01 for all January photos) on my Nas and most of them are keyworded. Now I want to create some sort of ‘dynamic’ LR catalogue that spans all the years (2004-2015+) that only shows photos with the keyword ‘Family’ (this is just an example). Is this possible and more importantly, can I keep this LR catalogue up to date without me constantly adding or deleting photos. In other words: My LightRoom Catalogue ‘Family.lrcat’ looks at all my photos (2005-2015), but includes only those that have the keyword ‘Family’. What would you recommend for someone that has both a laptop and a desktop for editing? I would like to use my laptop for editing while I’m travelling, and use my desktop for editing whenever I’m home. It seems like it’ll be confusing though to sync the files between my laptop and my desktop constantly. I could probably just keep all my main files on external hard drives so that whenever I’m editing on either computer the edits are stored in the DNGs, but the catalog on my desktop and my laptop will be different. What are your thoughts? I would also like to have a hard drive array connected to my desktop for backup, but with all these possible drive, it’s getting quite confusing. Thanks. I enjoyed you video and thorough explanation. After reading the comments it seems like everyone uses a subfile system and I don not understand the reasoning behind this. I import all my images on one hard drive as DNG. I rename by date and original file #. (some magazines want the raw files so I can find the original raw on another hard drive). The beauty of LR I think is the key words, color rating, filter functions and collections. Images can be found by capture date by using the meta data. For instance all my family photos are rated purple. I can filter by keyword, date, and rating to find anything I want. Or I can make a collection of the “family Grand Canyon 2014” and get better results than going thru a folder of a date or folders of trip or event names. Also an image could be put in the wrong date folder or trip name folder and be really difficult to find. I’ve been using LR for well over a year, and have yet to find anything that has explained the file system as thoroughly as you have, so I thank you! Having said that, I have an important question that I hope you can answer. I organized my folders according to your set up. I am working with LR 5.3 on a Mac. I just did my first import following your systems and my dng’s are now located in my ‘photos’ folder, 2015 and in a sub folder, in this case named ‘autumnintolland’. I’m assuming that is what is supposed to happen. Now, the jpg’s are located in ‘Pictures’ in a folder by the same name. Is that suppose to happen? If the jpg’s are in a separate folder in Finder/Pictures, then how does that eliminate the cumbersome issue of having so many folders? Won’t each import generate a folder in Finder/Pictures if I follow your set up? Did I do something wrong? I sooooo hope you can help me, because I seriously have been trying to ‘get’ LR from day one, and have spent countless hours and $$ trying to figure the import process out, to no avail, but I feel I’m getting really close with your help. Can you offer me a paid service, 1-1 on Skype please? I think I will need an hour or two to help me get started with LR6. Please reply via email. Thank you. Why are there no more answers to these questions????? Thanks much for this article. I’ve “fooling around” with Lightroom for 2 years, mainly because I have changed my system of organization a few times, not sure how to go about it. Thanks to you I’m on the right track. organize many years of many photos that will make sense and not take gobs of time. Thanks so much for the excellent demo of how to use Lightroom to organize photos. Now I can organize years of photos without spending gobs of time! Great tips and information, it has changed the way I use lightroom!!!! Thanks! Thank you Nassim for this outstanding explanation. Thank you for spending your precious time to bring this valuable piece of information to everyone that uses the lightroom program. I am new to this, have been seeking a product that allows retrieval by keywords. I have about 8,000 images organized as ‘mess’. My need is to retrieve images to use for inhouse prepared flyers for travel promotions. I would like to be able to do a simple boolean query of keywords like Poland+Mountains OR Zakopane. Have never used the Lightroom, it sounds like it will do what I want and then some. My questions 1) is there a limit on keywords, if so what? 2) Can you provide an example of a retrieval query so I can see how it is structured? First of all, it’s a great and very useful article! Thanks! However, I have a question. What if we want to repeat this procedure multiple times in the same folder? Eg. On day 1, I imported a bunch of photos in a folder named ‘LovelyPhotos’. But on day 2, I realized that I have some more photos which I need to import into the same ‘LovelyPhotos’ folder. If I follow the procedure now then the order of the photos will get messed up. Any solution for this problem would be appreciated. Thank you. Importing photos in LR using “import” option using either “Add” (does not move the files on the disks) or “copy” (makes a new copy from the existing location, to the one you specify in LR),or “Move” (move your files from existing loacation to the new folder location),theses three options won’t add the files to a “Collection” unless you choose on the right side of the screen the option “add to a collection” at the time of importing them. They will only add theses files in the folder you specify such as “LovelyPhotos” . You can choose any existing “collections or use the ” + “sign and create a new one where you want them to be added. If you forgot to add them at the time you import them, you can display them in LR in the “Library module” and find them in the “folders” sections to display them all ,and choose them using “CTRL” click one at a time or “CTRL+A” for all displayed in the folder. You then drag one in its center icon and all the ones highlighted by your selection will be dragged in the “collection” you select. Note that no files are moved for adding files in a collection”. A “collection” does not create any folder on your disk, it is only a way (database) for LR to find rapidly files you would like to find such as “vacation”; “birthday”; “Children”; etc. even if they are not saved in the same folder. Nice article. I feel bad that I did not check this till now. I need an advise from you. Moreover, all NEF files prior to 2016 is stored in External HDD. What you think is the best way I can reorganize this using LR? Dear Nasim – firstly, thank you with other guys for all the work – i’ve learned a lot from you all. I need an advice in moving my Photos folder to another hard drive. My current Photos foler is stored in dirve C (C:/Photos) There i have different folder for each year and subfolders for different events. In lightroom i do not see the root folder Photos, just subfolders with events. So i can not move one root folder in other drive with lightroom. And to move each event in every year folder is a lot of work! How i should move Photos folder properly? I have a doubt of exploring the photos in explorer. Can u give the idea to explore multiple images in windows. If we selected a photo in lightroom, right click show in explorer paves the way to find the image path. By the same way For multiple images?.. If there is any way to explore it?? First off great article. You have inspired me to me to get organized. I have been using lightroom for years but my photos are organized in collections. My folders are very disorganized. I have a folder for each year and then folders inside those from each import. Some folders only have one photo inside. I am wondering the best way to go about reorganizing. I would love some input. thank you for a very informative article. However, I would appreciate your comments regarding my own file system which I adopted a couple of months ago having changed from “Date” to “Place” filing prior to moving to Lightroom. I did it this way as opposed to the “folder for Each Year” because I found it much easier to remember the place. I think I’ll have to fine tune it but as said, I’d appreciate your comments before I hand over to Lightroom. Great write-up that will no doubt help like crazy! I have a couple questions that I wanted to mull around with you to see if I am on the right track. I am one of the numerous people who suffer from Photo and Video file structures. While I know LR can work with video files I am not sure I want to go that route. Would it make sense to have all my photos organized through LR and then just have an identical folder structure for my videos organized by me in a different folder structure? IE Root>Photos > Year > Location > date-customtext-P-sequence number and then Root > Videos > Year > Location > date-customtext-V-Sequence? The V and P in the names would help especially for shoots that contain both photos and videos. This would allow them to stay apart while LR still keeps control of my photos. Would an independent LR catalog for just video make sense? Also I shoot photo based time lapses. I feel as if a catalog for just time lapses would make sense as a single time lapse can be 500-2000 images. Do you agree? Lastly how do I keep my catalog with previews on my mac laptop but my full file structures on my Raid so I can still edit and review on travel and is there a good process to having a “Travel Catalog” that I can merge with my primary when I get home from travel shoots? Sorry for the exhaustive list of questions but as a filmmaker/photographer I am really having a hard time developing a great structure for Photos/Videos/Timelapses/Travel best practices! My wife and I both shoot proffesionally under the same business name. Sometimes we share camera bodies. I am curious about how y’all like to set copyrights. I know we can set in camera. Will LR’s default over write it? Is there a way to set it for either user etc without having 2 different devices/systems, etc? It’s very helpful post. I have just started using Lightroom. with your expert guidance, I could start with it. At present, i am managing all my images on the external hard drive. I want some of the selected images to be stored on MACBOOK hard drive wth the same catalogue name. Is it possible? Hey i really like this structure, and i am going to try implement it to what i am already doing currently. I have one question though. When you export your edits into .jpg, or .png or whatever you choose, what are you doing with those files. Are you saving them in with the RAW files? or in a separate folder within the event folder? Interested to hear what people suggest. I rally dont get way lightroom not can organize all your files when you move them into lightroom buy Import… Liike by year,camrea and file typ in to folders..??? 2) Open LR, create a catalog for the entire Photos folder. My question is, how do I make LR save all the edits from steps 3 and 4 on the original folders? I want to preserve the resolution of the originals to what they were, but use LRs import and manual edits to rename files and delete un-necessary files as well as preserve edits like cropping etc permanently. Is this possible to do in LR? Is there anything wrong in doing this that I am not understanding? Appreciate your help so much! Great article and I would like to implement your yearly catalog idea. Currently I have one insanely large catalog from day 1 when I started photography back in 2010. I shoot a lot now. All my photos are stored on external drives. Many and different sizes daisy chained to my Mac. This has to END. So looking at your Synology suggestion. The question is how can I go back and optimise LR catalog per year now? And when I edit photos now, I guess I open only 2018 catalog and work from there? I need to reorganise everything and implement good back up solution. But first I need to speed up LR and organise catalog.